A certain cell type is responsible for the colour of the skin and coat: the melanocyte. Inside these melanocytes the formation of pigment granules takes place. These granules consist of the actual pigments: eumelanin and phaeomelanin. Eumelanin is responsible for the darker colours such as black, blue, chocolate brown and phaeomelanin causes the lighter yellow/red colours such as tan, red, yellow. The melanocytes originate in the embryo from the so called neural crest. At a certain point in the development of the embryo these cells migrate to various parts of the body where they will cause the colouring to show. Also various sensory cells (e.g. from the eye and ear) originate from this neural crest. A number of genetic defects of the sensory organs is connected to certain colours and patterns, because of problems with this migration. Inside the melanocyte a number of mechanisms control the formation of pigment. A couple of enzymes catalyse the chemical transformation from tyrosine to the resulting pigment. The rate of activity of the enzymes is controled through receptors in the cell membrane. 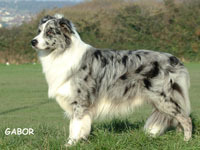 The genes that determine the coat colour can influence all of the processes mentioned above (plus a few other processes). The method of interaction of the individual genes (loci) will be explained below if possible. ely white Borders usually are swsw (except for double merles). 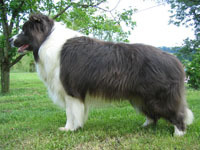 It is very likely that a number of modifier genes causes the variation in markings. Since the variation caused by these modifiers is rather extensive the various markings blend into another marking. This locus controls the distribution of pigment in an individual hair. This gene acts in the hair follicles where the melanocyte can switch between eumelanin and phaeomelanin (dark pigment and tan pigment). The actual switching mechanism is unknown, but is situated in the dermis and for some alleles in the epidermis. 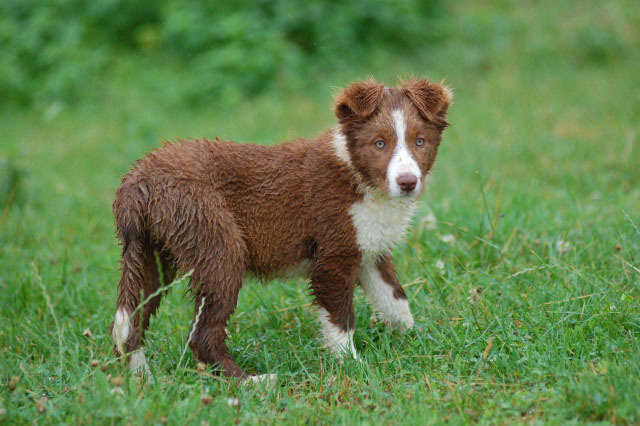 The agouti colour does not occur in the Border Collie as far as I know. The sable colour is rather rare and does often not show the classical effect of a dark dorsal area with a lighter abdomen. The hairs have dark ends. 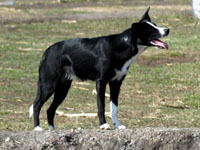 Some authors suggest that Ayat dogs have a darker colour than AyAy dogs. In mice however AyAy is supposed to be lethal (prenatal). 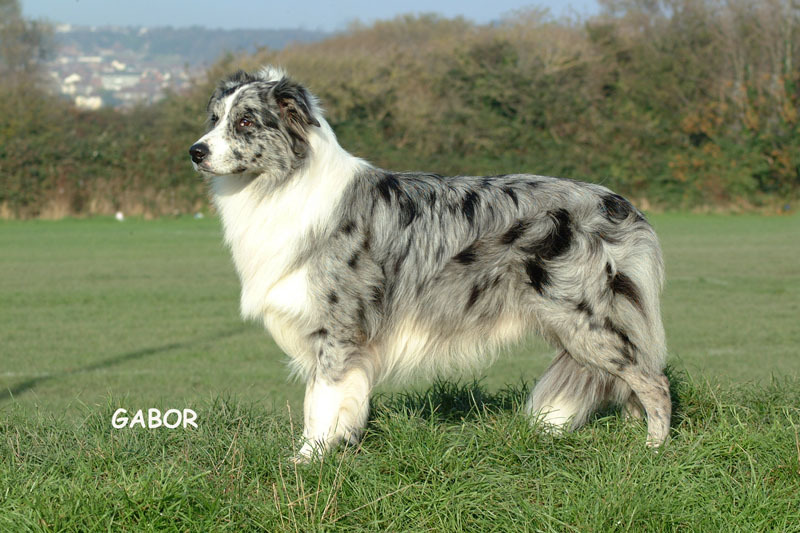 The at allele together with white markings produces the tricolour pattern. The transition of tan coloured hairs to dark hairs is very sudden. 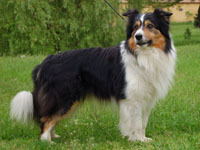 Tan markings occur in certain areas: above the eyes, on the cheeks, at the shoulder joint, the front and innerside of the elbow and the lower arm, the front and innerside of the knee and lower leg and below the tail. 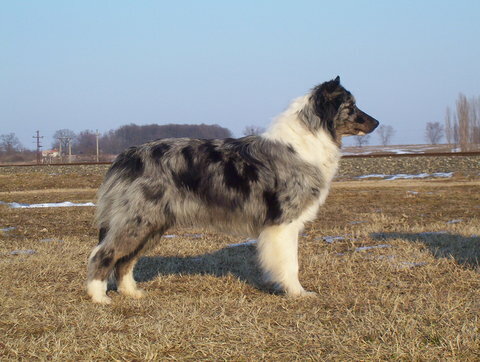 The dog must be homozygote atat) to have tanpoint markings. Many authors also mention the saddle pattern. 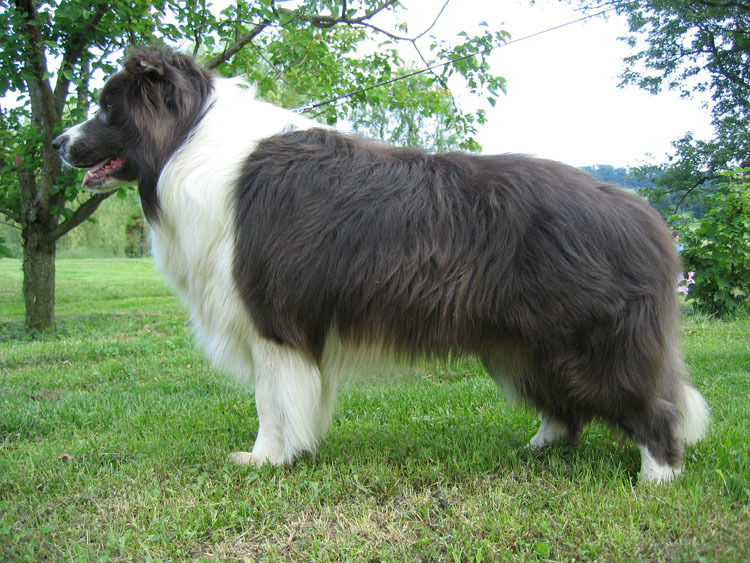 The dark colouring is concentrated in a saddle-like patch on the back. 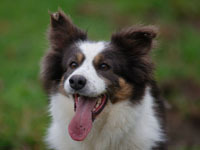 On the head one can also find black markings. 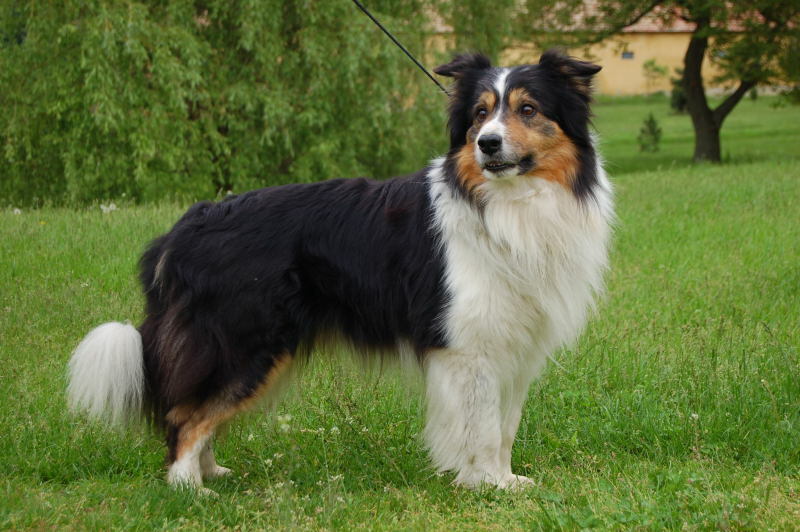 The pattern is not as specific as the tricolour markings. This locus encodes the Tyronsinase related protein 1 (Tyrp1), which catalyzes a quite distal step in the synthesis of melanin. The eumelanin granules in bb animals are brown instead of black and shperoid instead of ovoid. The D-gene determines the shape of the melanocytes. In dd animals the pigment cells are misshapen, the pigment granules are fewer and larger, and the cells have fewer and thinner dendritic processes. The result is that the colour looks paler, although melanin production is not affected, nor is the microstructure of the pigment granules. Black becomes blue, chocolate brown becomes lilac. The activity of tyrosinase is controlled by a few receptors in the cell membrane of the melanocytes (so called melanocortin peptide receptors); one of which is MC1R. These receptors bind melanocyte-stimulating hormone ?MSH and other melanocortin peptides. 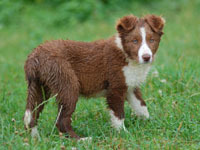 The extensions gene interacts with the agouti gene through these receptors: Ay dogs have a defect in the synthesis of ?MSH, resulting in phaeomelanin becoming visible. This gene has acquired quite a bad name. 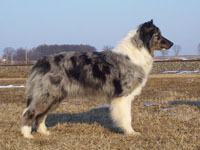 If this dominant gene is present only once, the base colour changes into an irregular pattern of various grades of dilution. 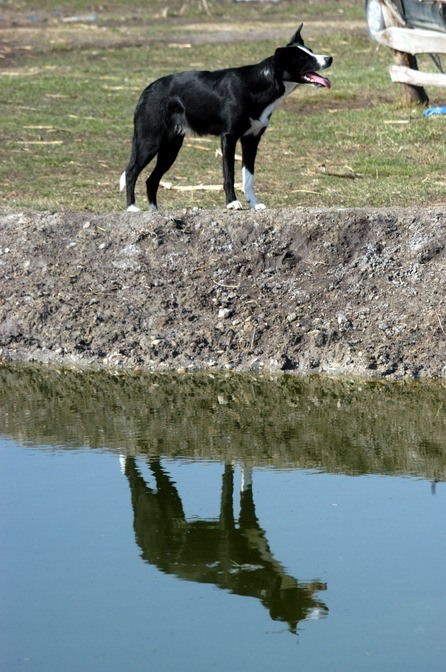 If the dog has two copies of the allele (homozygous), the dilution is much stronger. 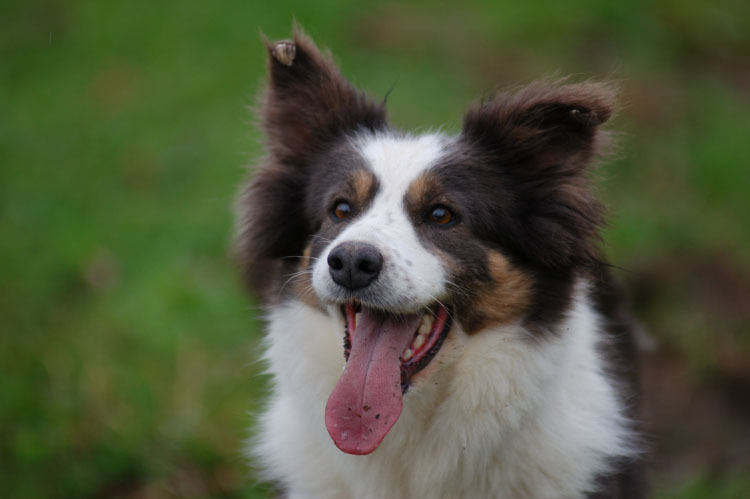 The often (nearly) white animals can suffer from blindness, deafness and/or be sterile. This type of dominance is called 'incomplete dominant'. 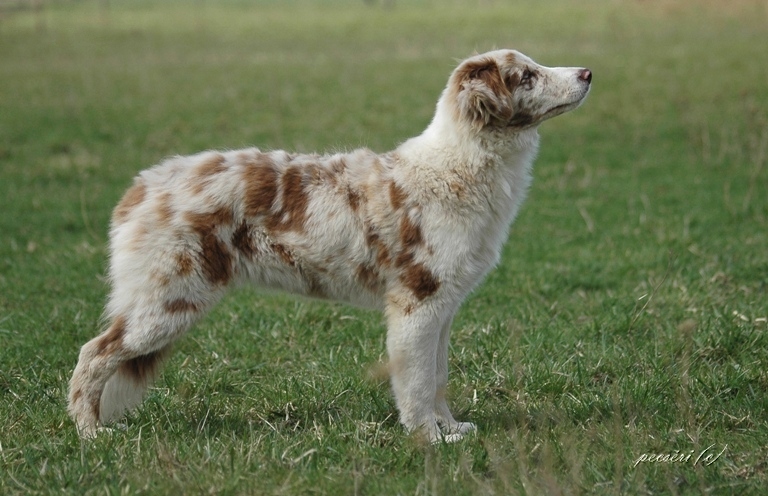 Although a single Merle gene is visible the effect is fully visible in a homozygous animal. To the best of my knowledge there are no adverse effects in heterozygous animals which makes the colour safe to use (if no Merle to Merle matings are used). In general there should be no fear of 'carriers' for this gene since the effect is easily visible. 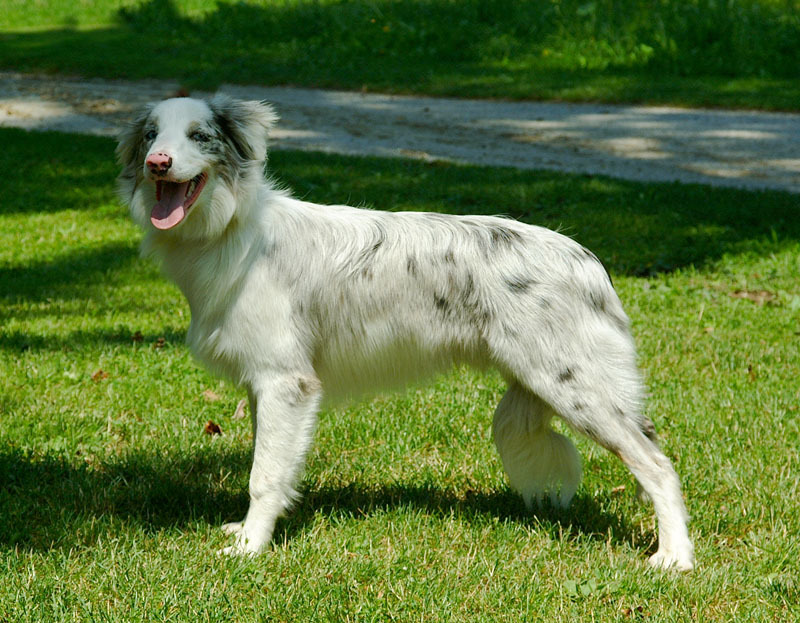 In very rare cases a dog can look like a non-Merle, while he is genetically a merle ("Phantom merle"). 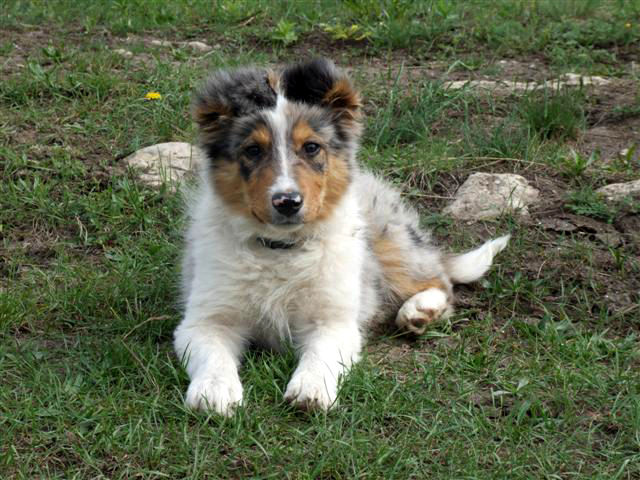 When such a dog is mated to a merle part (25%) of the pups will be homozygous for merle. 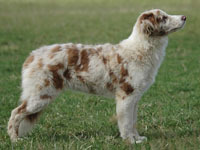 In Sable Merles the merle pattern is actually only visible in pups. Later on the effect is nearly invisible. To be on the safe side one should not mate sables to merles. Controls the distribution of colour on the body. Various authors are rather unclear when it comes to describing the different patterns. 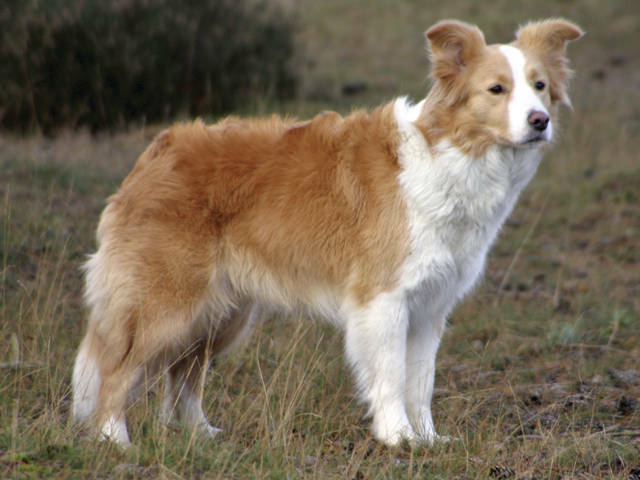 S is hardly present in the Border Collie and sw is rare. A few authors mention that sp causes a rather irregular pattern. 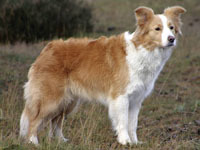 Probably si is the most common in the Border Collie. 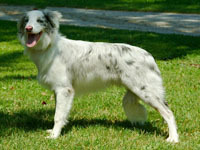 Extremely white Borders usually are swsw (except for double merles). 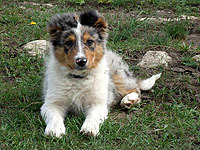 The white parts of the dog contain freggles. This causes the mottled effect in the Border. Accordign to some authors this gene show intermediary inheritance, so TT animals are heavier ticked than Tt animals. This table tries to match the various colours (phenotypes) with the present genes (genotyp). Is in the presence of a dominant allele the other allele is unknown or without influence this is denoted by a minus-sign.